"Running Jewelry, Personalized Double Ring Silver, Diamond Race Ring"
What a great way to celebrate and remember your accomplishments. Stamp anything you want on the first band (up to 12 characters) and then start adding a diamond to forever remember your milestones. personalization ideas: I DID IT!, 26.2, your goal time, FINISHED! 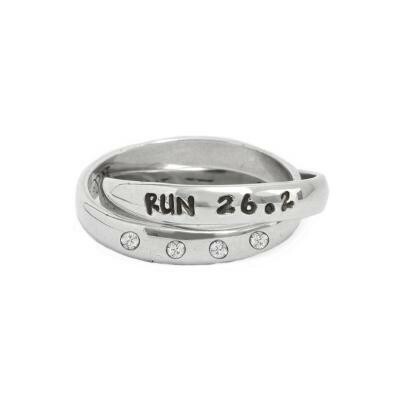 Our Runner's Ring helps you keep track of all of you accomplishments. Whether it becomes a Marathon Ring or a Race Ring, each stone can symbolize a finish line of accomplishment! Nelle and Lizzy will help you celebrate each victory by creating a personalized ring by hand-stamping word, number or name on the first band and we will set one diamond in the second. As you complete more races you can send the ring back and have additional diamonds set. Included in the cost above is one band stamped with your customization of up to 12 characters/spaces and 1 diamond set in the second band. Please indicate below the number of diamonds you would like on the second band. Each diamond will be set about 1/4" apart unless you specify otherwise. If you would like to add more diamonds as you complete more races, simply use the product return form to send in the ring and we will add the additional diamonds at a cost of $50 each (return shipping included in fee). We only use sterling silver in our silver products.